My son is sick for the third time as many weeks. Three weeks ago it was the flu, ten days ago it was a cold, and now it’s another virus with a fever. The only good thing is that I am not working and I can be there for him when he needs me. He’s still going to day care part-time for socialization and fun and I’m trying to decide if that’s worth it considering all the bugs he is picking up there. He hasn’t been this sick in at least six months. I’m catching up by posting two weeks in one. 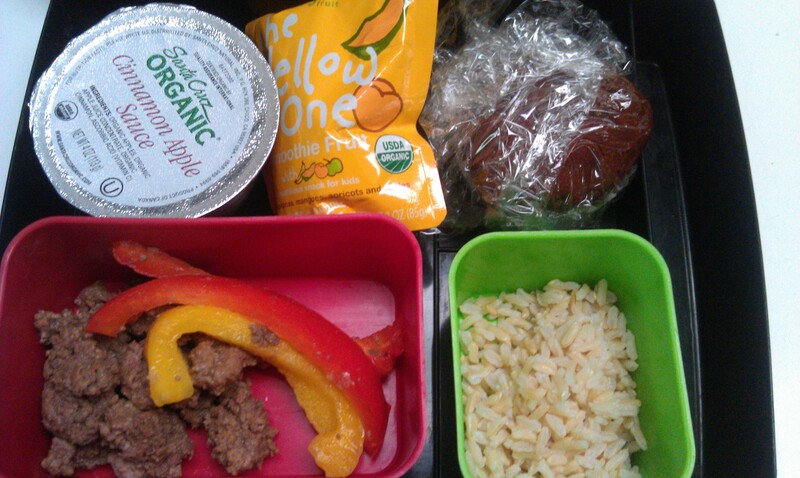 Also, I’m not going to post my lunches this summer (instead I’m sharing recipes related to our CSA). I need a little break taking pictures of my own lunches. I’m hoping you’ll understand! I tried to match what the other kids were eating. Day care menu: Sliced turkey and mozzarella on a wheat tortilla, pinto beans, and diced peaches with yogurt and watermelon as snacks. 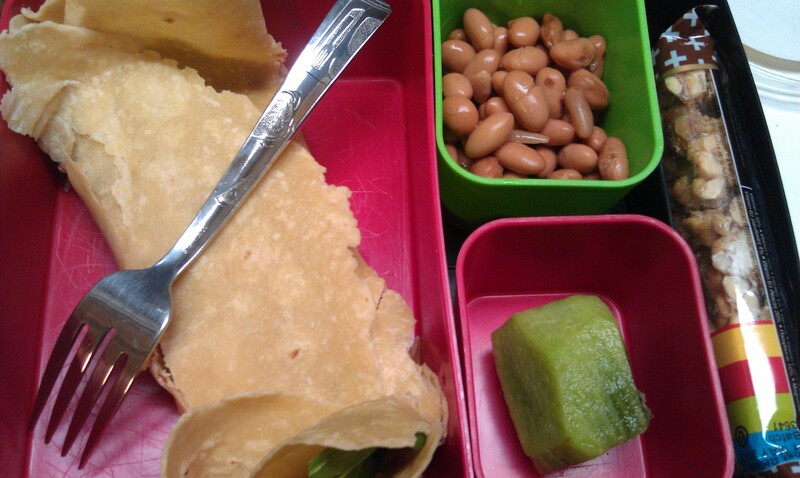 Turkey wrap, pinto beans, kiwi, KIND bar – YUM! 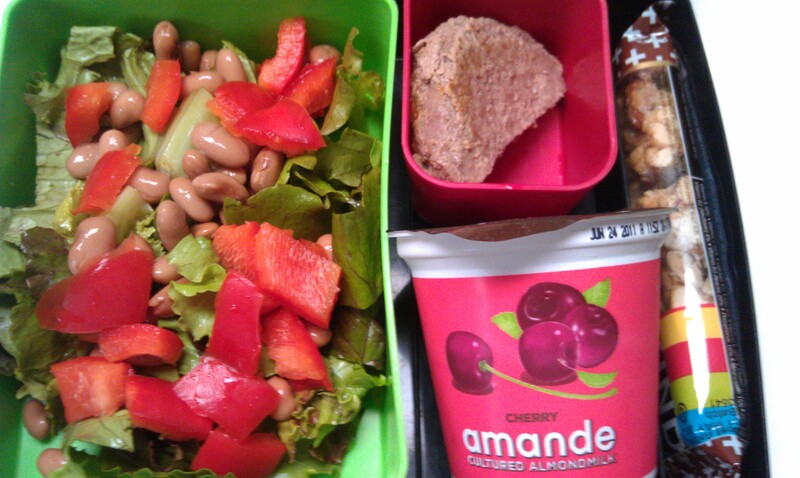 The almond yogurt did not fit into the Laptop Lunch box by the way. I just put it there for the photo. I enjoyed the almond yogurt and so does my son, but I can’t send those with him because lunches have to be nut free at his day care. Why do lunches have to be nut free? Because of nut allergies. It’s a common rule for many schools, day cares, etc. Just incase other children are allergic. Some are highly allergic and can get allergic reactions from it touching their skin etc. Other kids allergies is usually the reason. As for his tantrum after having artificial colors, I agree that it’s totally possible. Whenever I heard people say that dyes caused “hyperactivity in children,” I never actually believed them. I don’t have my own kids but I can tell a difference in my own behaviour when I’ve had junk food and I’m an adult! I’ve got no doubt at all that you’d be able to tell the difference in your own child after he’s eaten something unusual. It doesn’t mean it applies to every child but that doesn’t mean it isn’t true. Maybe it was the lunches I sent. It looks like you’ve mastered the formatting thing, Mrs. Q! This post was really easy to follow. 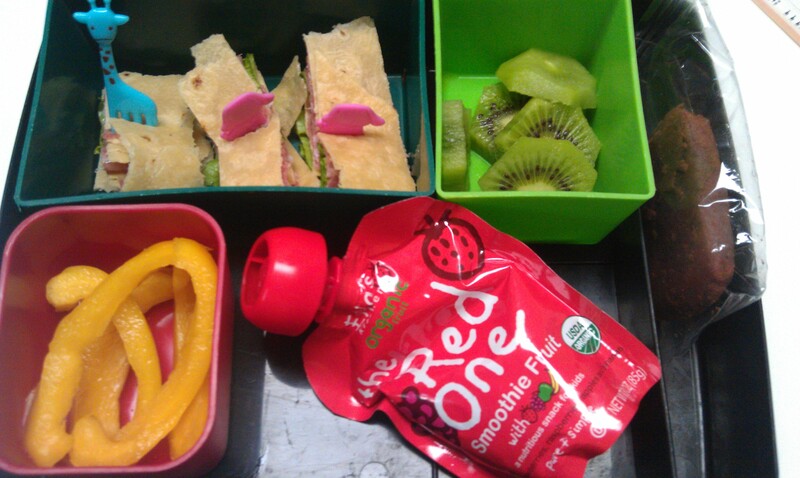 Can you tell me about the little smoothies your son has in his lunch (what exactly are they, where do you get them, etc). They look like a fun, nutritious snack idea. And for the record, I totally agree with you about the additives and dyes causing behavioral problems in children; as an early childhood teacher I witness it daily. I see/hear what the kiddos are eating and I can tell first hand how the artificial junk affects their little bodies. Sure this doesn’t happen to every single child, but it does affect a good amount of the population. They are Ella’s brand. http://www.ellaskitchen.com/ I bought them online a while ago, but I think you can get them from Whole Foods too! Doctors used to say that early exposure to virus, bacteria, dirt, etc is the way that adults stay healthy. The body cannot create anti-bodies if it never has contact with allergens, viruses, etc. Yes, you are right. I try to tell myself that my son will not be sick as often as kids who stay at home until they start preschool. I really hope he’s as fit as a fiddle then! How wonderful Mrs. Q, you’ve gotten the formatting down! What I really like about these posts is that I can sometimes find something new for my son to try. I haven’t seen almond yogurt at my local supermarket, only coconut yogurt and soy yogurt. Since my son is GFCFSF, I would love for him to try this one so he has has more flavor options. He just loves yogurt! I happen to agree with you about the dyes. My daughter is the same way, she tends to have behavioral issues after eating too many dyes, so try to avoid as much as possible. Otherwise, she gets extremely silly. She’s lucky though, I’ve known of cases where a child is allergic to dyes and needs to avoid completely. They cannot bathe or play with anything that use specific dyes. One boy in my son’s playgroup last summer couldn’t play with play dough unless it was homemade and dye free. He had to avoid lots of lotions, soaps and shampoos as well. If he did come in contact, he would breakout terribly. Thanks for figuring out the the formatting Mrs. Q. Love it! Thank you!! I figured it out. Do you find it difficult getting foods that are nut free and still healthy? When my daughter’s daycare gave us the list of foods that would be “OK” to bring in because they were nut free and not manufactured in a plant where there are nuts I was appalled…so much HFCS and other additives. So we do alot of fresh fruit and veggies and things of that nature…. We love nuts at our house. It is a struggle. I do the best I can! It’s tough. Wonderful format, really great! Thanks so much! Awesome! You’ve got a lot of time. I only just figured all this stuff out about food since eating school lunch for a year! Does the daycare have two snacks a day? Or just two choices for one snack time? I think it’s natural to look for a cause. I can’t figure out why he has gotten so sick over the past three weeks. It’s summer after all. Also he was healthy for a long time. Regarding ADHD, some kids respond with special diets and others don’t. You’re right that it’s out of our control. I just want to control things, I guess. 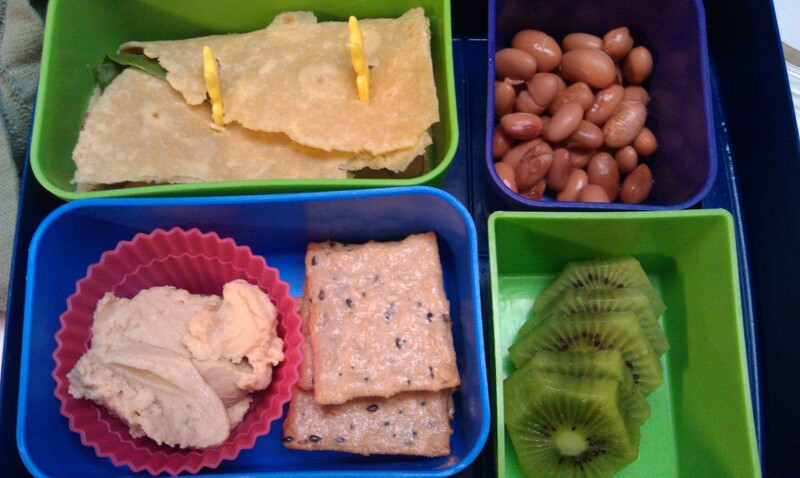 I really enjoy seeing your son’s lunches. Our 11.5 month old is very much into eating table food now and I struggle to think of new ideas for foods to send to daycare for her. 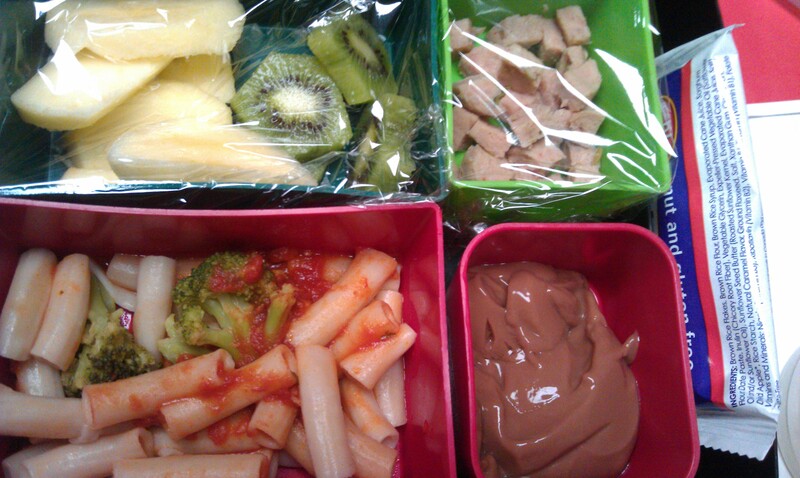 Seeing your son’s lunches gives me inspiration! Her daycare provides breakfast (cold cereal, often sugary) and two snacks plus whole milk for the kids over one. 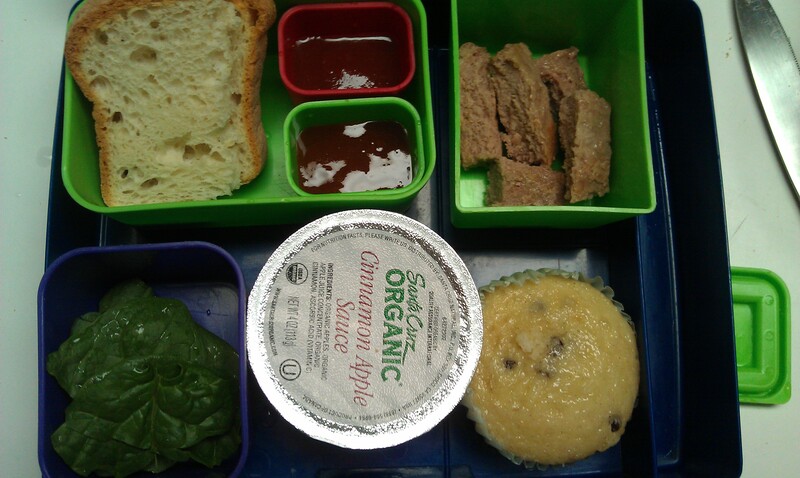 Parents have to send a lunch every day, and if you want different foods for breakfast or snack (or a different milk) that also must be provided. We love our daycare and and one snack per day is usually something pretty healthy like fruit, veggies, yogurt, etc. but unfortunately the nutritional value of the second snack is usually not up to par. The breakfast cereal selection is also a mixed bag – Cheerios are fine for pre-toddlers but not Cinnamon Toast Crunch! Because it’s too much of a pain to go through the menu and figure out what’s OK and what we will send in, we just send in all of her food. When she’s over 1 we will also send in organic milk for her once we exhaust the frozen breast milk (she is breastfed and will continue to nurse when we’re together). There are a number of families who send in organic/hormone free milk or rice or almond milk for their kids so we’re not alone in this. There are also a few families who also send in all of their kids’ food but I’ve been a bit shocked to see how many parents are apparently OK with their older babies and young toddlers having a sugary Popsicle or a pudding cup for their afternoon snack.